I got into the Shantae series back with the second entry, Risky’s Revenge. I had no idea what to expect, but quickly became a fan of this quirky little series. That appreciation grew even more robust when I tried out Pirate’s Curse, which introduced Metroidvania aspects to the game seamlessly, and seemingly improved upon every clunky aspect from the previous games. 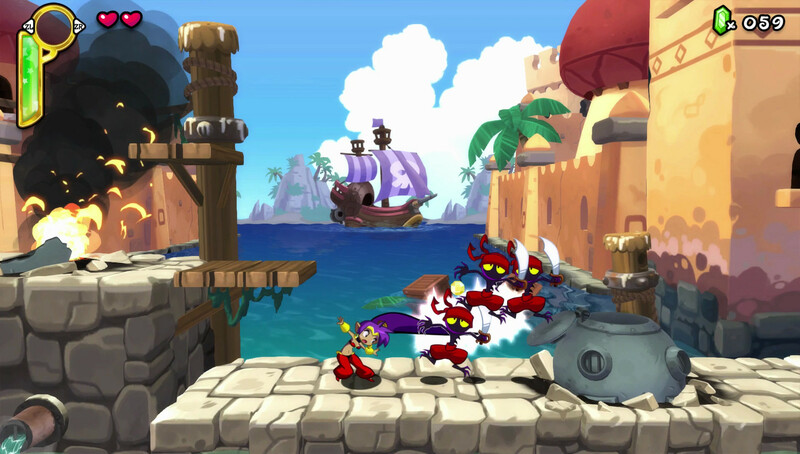 Which brings us to Shantae: Half-Genie Hero. This entry is unique, both because it was the first crowdfunded entry in the series, as well as the first HD prequel. I wasn’t sure how I felt about the graphical switch, since it saw the original sprites totally reworked, but the new style grew on me over time. 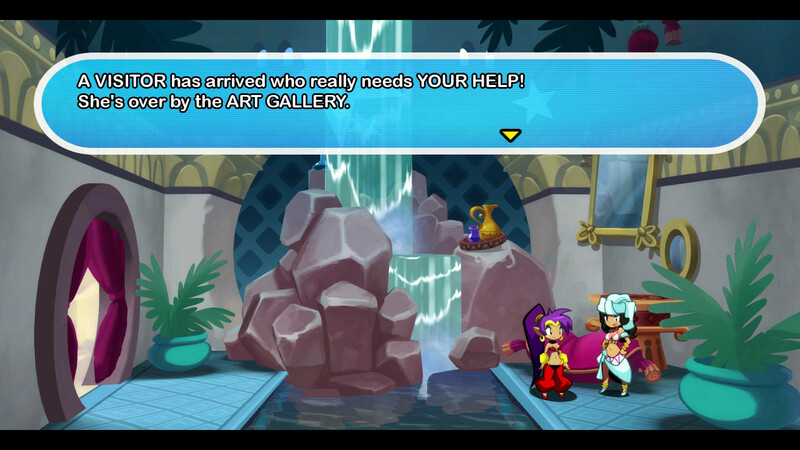 The question is, did Shantae: Half-Genie Hero provide the ultimate Shantae experience? Or did it take a couple of unlikely dance steps backward? The newest adventure starts with a perplexing dream where Shantae is informed of some nebulous threat to the realms of both man and genie by some talking cloud of light. She wakes up, only to find her nemesis Risky Boots is up to no good again, and the good half genie sets off to stop her! The first level is a docks area beset by hordes of Tinkerbats, and it really does an amazing job of showing off how incredible the series looks in HD. The graphical switch allows the talented artists to show off so much more detail that it reminds me of a beautifully rendered classical cartoon, and I couldn’t be happier. Colors are more vibrant, and every part of the world is just more alive than usual. It’s a real treat for the eyes, as you can see from the first boss screenshot below. Oh, and let me gush for just a second on how amazing the soundtrack in the game is. 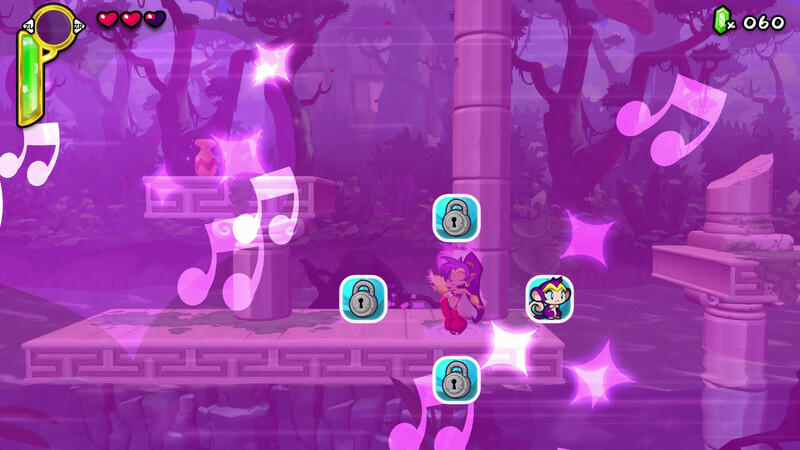 Every Shantae game has great tunes, but this one really outdoes itself, and though I lack the vocabulary to really express my love of the music, you’re sure to enjoy it immensely. Whatever you do, don’t call it P.O.O.P.T.O.O.T.! Stylistically, the gameplay in Half-Genie Hero is a bit of a retro backtrack, for both good and bad. While the last game was a deft Metroidvania, with lots of gradual progression and seamless exploration, this game hearkens back to Risky’s Revenge. What that means, for those unfamiliar, is that Half-Genie Hero is comprised of a linear level structure interspersed with fetch quests to unlock the next area. While that design is okay in theory, it was also the thing that frustrated me the most about both Risky’s Revenge and Half-Genie Hero. Can you be a wee bit more specific? When you are forced to find items just to progress, and all you have to guide you are vague, albeit helpful, hints, it can be incredibly frustrating when you are lost and forced to spend a lot of time searching. This happened a couple of times in my playthrough, which lasted about five hours and change, but both times I was wandering for upwards of an hour. The most frustrating incident was when I knew I needed an item in the Mermaid Falls, and that I needed my Mouse transformation to find it. Since the mouse can use tiny holes in the wall to travel to hard-to-reach places, I thought it would be a simple matter of finding one hole and voila. Instead, the giant Mermaid Falls is littered with false starts and secondary paths, and I totally missed the one entrance I needed until I stopped and retraced my steps, carefully looking at each inch of the stage. This was the one time that the HD nature of the game worked against it, since there is so much more real estate they can cram into each area, meaning when you get lost, you get lost for a lot longer. That said, the HD really does shine, as each level is composed of multiple sections, and each level is totally distinct from each other. Ranging from mechanical factories to blazing docks to derelict deserts to even haunted houses and magical carpet races, there is a lot to love for fans of the series. Transformations are as fun as ever, and much more diverse. The combat itself is fast and frantic as ever, and you have a ton of side weapons at your disposal, such as fireballs, pike balls, scimitars, bubble shields and much more. 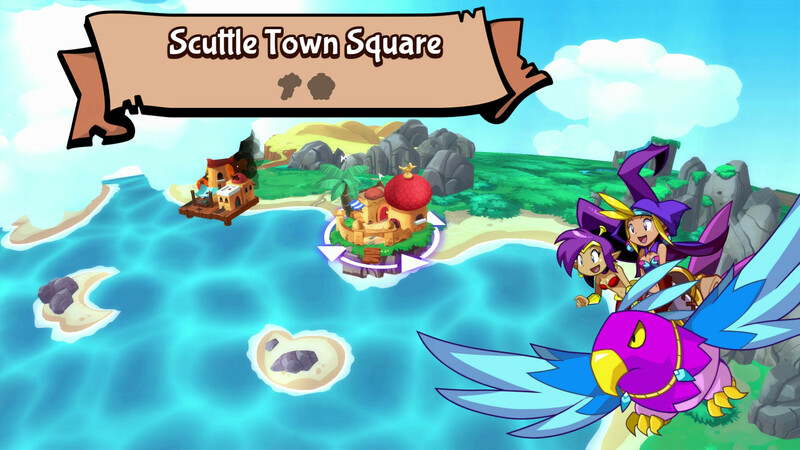 All it takes is some hard-earned cash to get it from the hub area of Scuttle Town. I also appreciated that many of the standard enemies don’t go down in one hit, and take repeated hair whips to bring to heel. Also, even though the Metroidvania emphasis is toned down, you can still find artifacts and extra heart containers to help yourself out, including some utterly marvelous new transformations. While you are still able to try standbys like the wall-crawling monkey and hard-hitting elephant, there are new ones like the adorable sea-faring crab, high-flying harpie, creepy spiderwoman and much more. Not all of them are strictly necessary to progressing through the game, and some you will only use once or twice as you play, but it was nice having the wide range of options at your disposal, especially for the later areas of the game. My biggest note here is that I wish you needed more of the transformations to unlock new areas, and that they weren’t just relegated to hunting for items for beating the game with 100% completion. That’s definitely a bit of a missed opportunity, though I’m sure WayForward was a bit overwhelmed by the number fan-inspired transformations that were utilized in the final game. Just visit Sky and Wrench to get a lift wherever you need to go! It wouldn’t do the game justice to discuss the combat and not mention the boss battles. 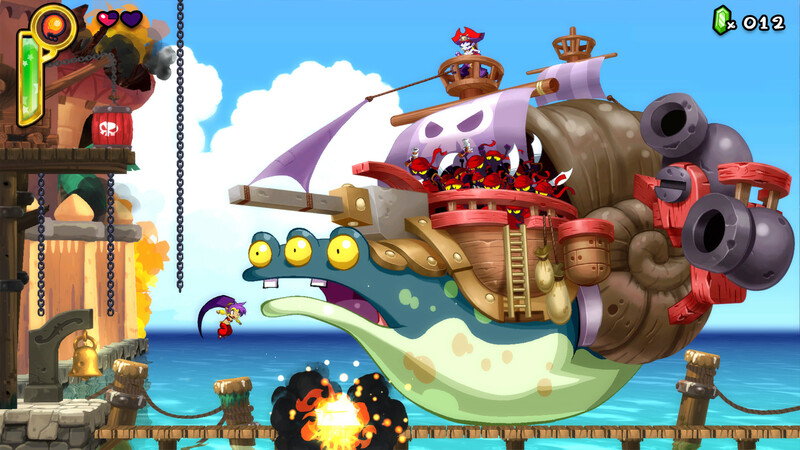 While I have always enjoyed the boss fights in Shantae games, I can say without reservation that the bosses in Half-Genie Hero are the best in the entire series. Though there are a couple that were frustrating for various reasons, they were all large, incredibly diverse, well-rendered and challenging fights. There’s not a single one I got through unscathed, and I even had to try a number of times to finally beat the intense Giga Mermaid battle (though that is partially due to me not realizing what her weak spot was). This does bring me to one minor complaint – the game offers the chance to save after you beat each section in a given level. If you save before a boss fight and then die, you are allowed to try your luck again, with one proviso – you are left at one fraction of one heart for your health. Against the Giga Mermaid, that meant that if I got hit by any one of her screen wide attacks, I had to start over from the beginning. Which was especially bad since this was a multi-part battle. Luckily, after the mermaid incident I quickly learned to always go out equipped with tons of recovery items, such as Gator Steaks, Oranges and Elixers. 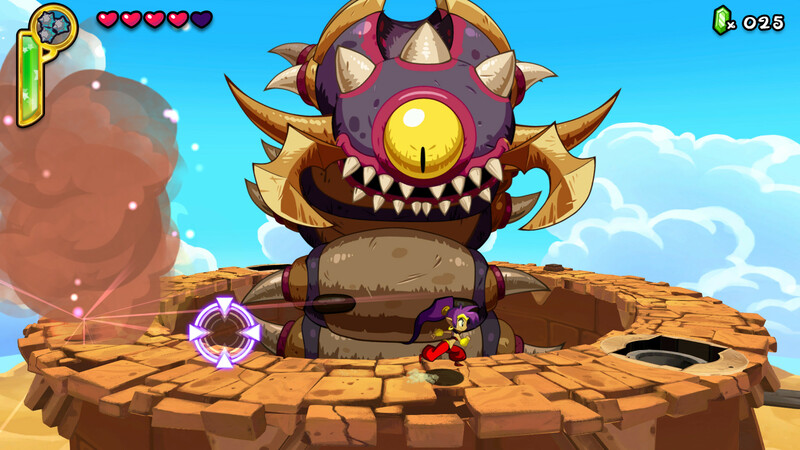 You’ll need all the health you can get, cause these fantastic bosses are really no joke, and fights make you appreciate some of the recurring characters in the Shantae series even more (looking at you, Ammo Baron!). Meet “Wilbur”. He’s very hungry. 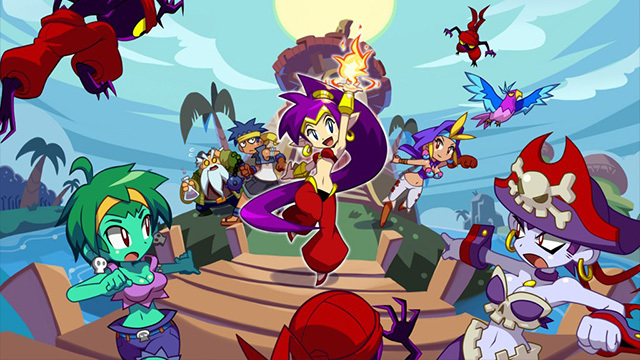 Although no Shantae game is really known for its deep plot, I felt that the plot in Half-Genie Hero was a bit haphazard compared to Pirate’s Curse, at least until the twist at the end of the game. I can’t explain why without going into spoilers, but I just felt it would have helped players to have a bit more backstory to push things forward. That said, I definitely enjoyed my time with Shantae Half-Genie Hero. I managed to beat the game in five and a half hours with 84% completion (though I did manage to get the good ending). There is some replay value for completionists, and there are also art pieces to unlock, Hero-Mode and even playing through the game as Risky Boots herself! Half-Genie Hero mostly made good on all of my vast expectations, though I do hope that the next game in the series is more like Pirate’s Curse. That said, if you’re a fan of Shantae, you can’t go wrong with Half-Genie Hero for $19.99, and I’m very happy to have finally been able to play this gorgeous HD game on my Wii U. Until next time, Tinkerbackers! And keep up the good work, WayForward!